warehouse, lager, stock, magazzino, estoque, contabilidade, accounting, goodsidespread. Purpose of the program: accounting of inventory, production of goods as a small company, or a large enterprise. Unlimited number of suppliers and warehouses *, types of goods, commodities *, units, products and templates to him currencies. 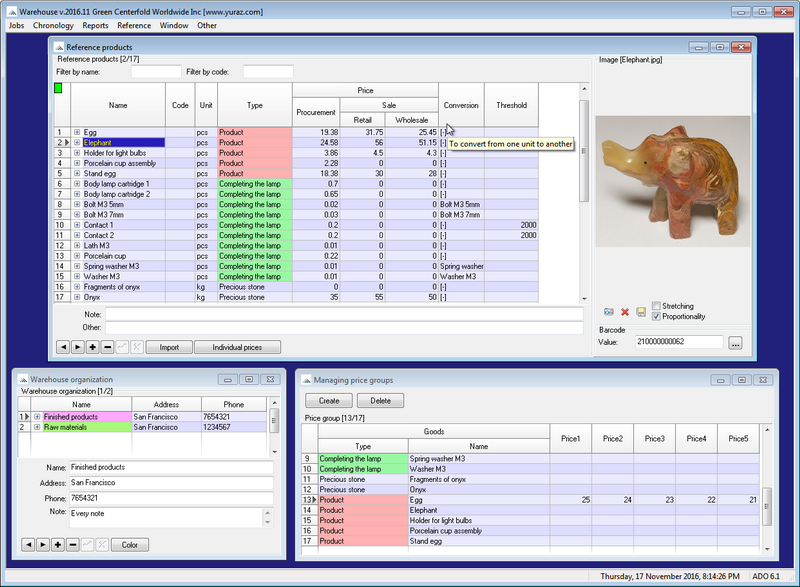 Displays the status of the most convenient warehouse, the warehouse of goods and type of filter, sorting by any column. Individual coloring warehouses kinds of goods. Support for bar code scanner on the sale of goods. Supports any "typing" the barcode scanner that emulates the keyboard. Unlimited number of printed documents in the history of the parish and consumption. You can create and print any subsequent your template. Print price lists, price tags, barcode labels. Templates are products in a tree structure that allows you to quickly navigate in the tree, details of minor importance to the core. Manufacture is carried out "at one point in one product" in any quantity. The maximum number of products depends on the availability of parts in stock. Accounting staff, working days, teams, piecework payment and the fixed salary. Maintaining funds, current accounts (their number is not limited). Customizable background color of the desktop program, which has beneficial effects on vision. In any table is possible to increase the font. The small size of the program. The apparent simplicity. Main: parish / flow / state warehouse, other forms are secondary.